Since January 7th, my church began 21 days of prayer and fasting as we entered into the new year. We believe these 21 days are a time to set the precedence for the whole year. My friend, Taylor, and I decided to do a Daniel’s fast as our commitment. If you look in the Book of Daniel in the Holy Bible, Daniel, who was a Jewish wisemen during the reign of the Babylonian king, Nebuchadnezzar, and then Belshazzar, only eats veggies and drinks water for 10 days (Daniel 1). Later in Daniel Chapter 10, during a period of mourning, Daniel does not eat choice foods, drink wine, or use lotions for three weeks (21 days). At first, this fast was difficult, but we have adjusted to this new diet (almost as soon as the fast is ending). Now, we are eager to incorporate this diet into part of our lifestyles (a.k.a. eating less meat and consuming less caffeine). During this period of time, God has challenged me in new ways. I started leading a small group through the church and Taylor is also co-hosting. God has challenged Christian and I in our marriage. God has also granted me clarity in some areas I have been asking questions about. But, all of this only happened through commitment to His Word, prayer, and fasting. I thought during this fast it would be relevant to read the book of Daniel to gain insight and understanding of Daniel’s character and how God challenged him as well. Growing up in church and attending VBS (Vacation Bible School), I always remembered the stories of Shadrach, Meshach, and Abednego in the fiery furnace (Chapter 3) and Daniel in the Lion’s Den (Chapter 6). These were two of my favorite stories growing up, and they are in this amazing book. There really is so much in this book to unpack. These are not in any particular hierarchy. However, I have really honed in on how the book of Daniel emphasizes the importance of humility. Perhaps, this word has become so important to me, because it is Christian’s word from God for this year. Humility. As I have said, the book of Daniel has gained a lot of its attention from the popular stories of the fiery furnace and the lion’s den. These stories are easy for us to digest and encourage us to rely on the power of God. We read how God protected these men from what should have killed them. We are encouraged to put our trust in the Lord, because we know He has the power to save! Well, let’s look dig a little bit deeper. I want to emphasize the importance of submitting yourself unto to God and how He humbles us. These may not be the most exciting topics. They even hurt a little bit to hear. But I really believe that this book was partly designed to show us the importance of humility. During his reign, King Nebuchadnezzar has dreams that he does not understand and needs interpreting (Chapter 2 & 4). After the Babylonian wisemen fail to interpret the king’s dreams on several occasions, Daniel repeatedly amazes everyone with his gifts. He successfully interprets the King Nebuchadnezzar’s dreams and later interprets signs from God to his successor, Belshazzar (Chapter 5). But if you notice every time Daniel interprets a sign or dream, he acknowledges that it is God allowing him to do this. It is not by his own strength but the Lord’s. We should also acknowledge that our gifts and abilities come from God and are not in our own power. Without God, we are capable of nothing. Principle 1 of Humility – Always acknowledge God in all you do. On the other hand, as we look at these two kings, and we can see the consequence of not acknowledging God in our lives. Nebuchadnezzar is exiled and loses his mind for a period of time (Chapter 4) and Belshazzar is murdered (Chapter 5) and his kingdom taken over. Principle 2 of Humility – Do not get a big head. I think the greatest difference between these two rulers is that Nebuchadnezzar does acknowledge the God of Daniel and the Israelites is the God of gods and Lord of lords while Belshazzar has no regard for this. Nebuchadnezzar sees these miraculous signs, like the three men he cast in the fiery furnace, and acknowledges and praises God. It just takes him three times to be convinced of the Lord’s power. But Belshazzar saw all these signs and wonders happening while Nebuchadnezzar reigned, but during his short reign, he gave no regard to God. In James, we are instructed this is sin. Principle 3 of Humility – Catch yourself when you are being prideful. We know better. I encourage you to dive into this amazing book in the Bible. It really is so powerful and has so much instruction for us as believers. 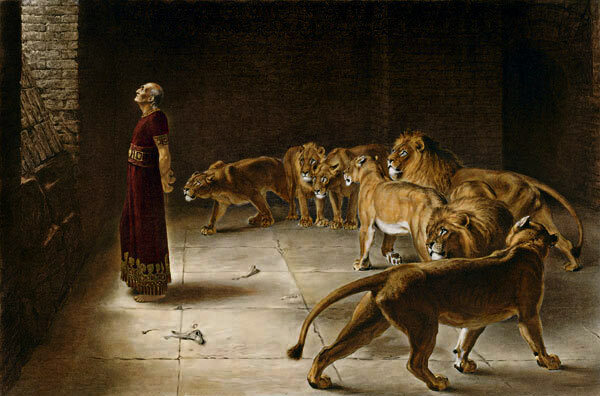 What is God speaking to you in Daniel Chapter 1- 6? Love this! I have been learning a lot about pride lately. So have I! God has been showing Christian and I that our pride is leading to our fights! For me, God has led me back to the times I fell into sin or deception and helped me see pride as a factor. Very well put my love! Pride is fuel for the devil to divide God’s children from one another. Yes exactly and to separate us from needing God!